• You might have missed it, but U.S. Olympic shooters hit the mark. 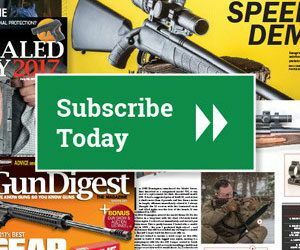 • News and notes from throughout the firearms world. • Black gun fun requires proper care and feeding of these great rifles. • French military weapons make interesting collectibles. • The Savage Model 1912 was ahead of its time. Here’s how to keep it running. • Now is the time to cook up some loads for deer season. Organization is the key. • There’s plenty of great gear for hunters and shooting enthusiasts. • Part of the fun of tinkering with a gun is seeing it shoot. • Long-range shooting requires a good stock. McMillan offers a great one. • Citizens demand that police officers shoot effectively on the street, but recent battles about noise and lead have left many police agencies without shooting ranges. The problem is not expected to go away soon.